Oversized fenders protect tires. The Bim Cart has a 14" Loading height. Front and back heel plates stabilize the cart and balance the load. 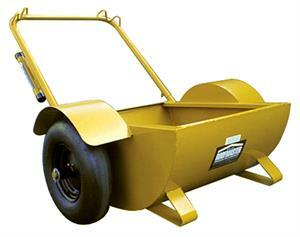 4.00 x 8 pneumatic wheels with roller bearings provide smooth rolling on roof surface. 360 Degree Splash lip prevents "Hot" from sloshing out of tub.